We live in the very special moment when our story is entering our story. This is the type of circular scenario I frequently use to try and explain the profound cultural significance of Big History. When I do, it is usually met with a blank stare. So I’ve been trying to come up with a new way of conveying what I mean. 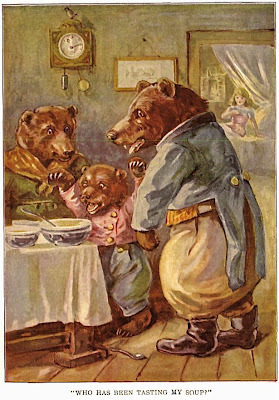 We all know the old English fairy tale Goldilocks and the Three Bears. Goldilocks comes upon the forest home of a family of bears who are out for a walk while their porridge cools. Assured that no one is home, Goldilocks tries out their chairs (breaks one), samples their porridge, and tests each bed until she finds the ‘just right’ size, temperature, and softness. She ends up falling asleep in the smallest bed and the climax of the tale is reached when the bears come home. 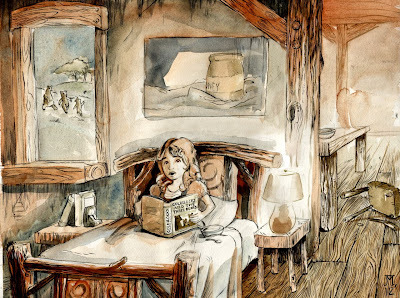 Wee Bear finds the little girl in his bed and cries, "Somebody has been lying in my bed, – and here she is!" Awoken and startled, Goldilocks jumps from the window, and runs into the woods, never to be seen again. 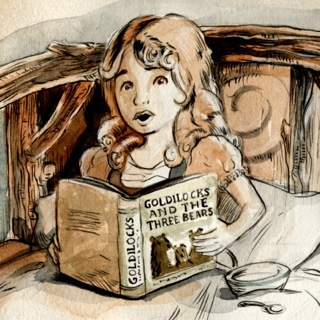 The Goldilocks story is the namesake of an important concept in complexity theory and Big History known as the Goldilocks Principle. In Big History and the Future of Humanity, Fred Spier, makes good use of the idea that complexity only emerges under certain ‘just right’ circumstances (aka boundary conditions). 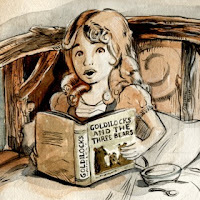 But I propose a different use of the Goldilocks idea; as a metaphor that describes our current predicament/opportunity. To make my point, the story would be modified just slightly. Imagine the plot twist if Goldilocks decided to do a little light reading before falling asleep. And what if the book she happened to grab off the nightstand was the story she was in? It's a moment captured on Goldi's face below. This is what I mean when I say that “we live in the moment when the story is entering the story.” Big History is our story and this is our Goldilocks moment. Yeah, we were young, we experimented, we even broke a chair or two. But now, as the bears come up the path, the story is in our hands, what plot twist can we write...? Translation: HEY SLEEPYHEAD, PICK UP THE DAMN BOOK!